We are filled with gratitude for all of our recent clients. An especially important thank you goes out to those of you who took the time to review us online. 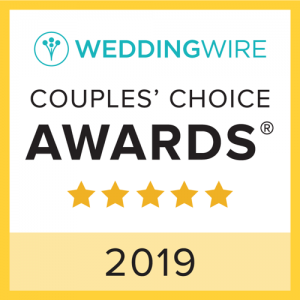 We are proud to say that we once again earned a “Couples’ Choice Award” from WeddingWire.com because of your generous reviews. “The Engagements made our wedding! “No other band could compare! I’ve been playing in bands for 30 years, and this is the band I hired for my wedding. These guys are far and away the best wedding band I’ve heard. In addition, Aaron is a great guy and a pleasure to deal with. He was one of the first people that I talked to in putting the reception together, and he really helped me wrap my head around what we needed to figure out and what we could leave loose. We (and our guests, who couldn’t stop talking about them) absolutely loved the Engagements!! They were so much fun, and truly, truly talented. If you’re looking for something a little different than the typical wedding band (think – lots of 70s-80s music, nothing too modern or pop-y) then the Engagements are perfect. They were SO much fun and learned quite a bit of songs for us, too! It really felt like more than just a wedding band, but like a real concert/dance party.